Pad & Quill make some lovely handcrafted cases for the iPad. 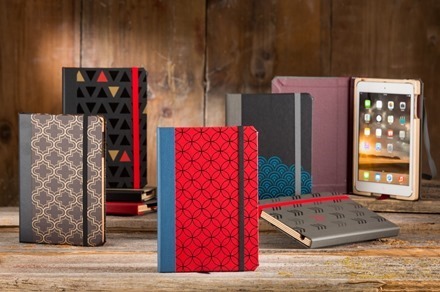 Their latest new collection is called the Author Series and allows us to build our own iPad cases with a fair bit of help and some unique patterns to work with. The series features 5 very handsome new designs from Tamrah Ryan, an artist from the St. Paul area where P&Q are based and where they make these cases. You can choose your colors for inside, spine, outside, and elastic – and also select to add pocket and monogram options if you like. And of course you then choose which new design to use on the case. I especially like the blue and black patterned one. The Author Series goes for $79.99. You can see lots more detail, customize your case, and place an order at the P&Q product page for the new line. Used your hints on how to sync my calendar & contacts w/ my iPad AWESOME!!!!!!!!! It worked like a miracle. I had tried others and this really worked!